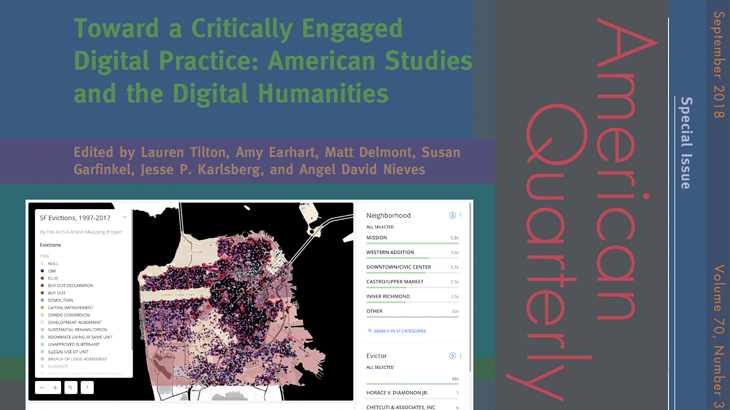 A new special issue of American Quarterly coedited by the Emory Center for Digital Scholarship’s Jesse P. Karlsberg examines the intersections between American studies and the digital humanities. The issue is the first in the field-leading journal’s history to feature a section of peer reviewed digital projects in addition to traditional articles and forums. The issue is available open access for three months through ProjectMUSE. foundational concerns for American studies—critical studies of gender, sexuality, race, class, nation, and disability, as well as interdisciplinarity and praxis—are underrepresented in many digital humanities journals and conferences (364). Centering digital humanities tools, theories, and methods in American studies scholarship offers opportunities to “expand beyond text as the main form of analysis and argumentation” in this crucial work, the coeditors write (365). The implications for sustainability of various digital publishing platforms. To learn more about the special issue, read the coeditors’ introduction. You can also access the digital projects included in the issue and those discussed in depth in its articles and forums on the issue’s companion website. stories American Quarterly, digital humanities, ECDS, interdisciplinarity. permalink.